Thoughts about planning aspects for the America's Cup returning to Auckland, syndicates locating in Auckland a year or more before the event, hosting the Louis Vuitton regatta in 2016 and the America's Cup defence match in 2016. "…the question arises as to whether or not there should be some form of public life or culture, accessible to all local citizens of the city; and if so, how this can be stimulated by local policies. This last question is particularly relevant in local politics. Is the city a product to be sold on the tourism market and/or as a location in which to invest money? Or is a city a place to live, where people can express themselves, even if it is in terms of resistance to, rather than rejoicing in, the dominant culture?...." 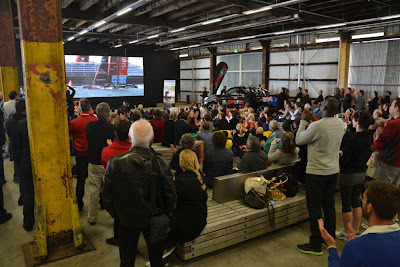 (Bramham et al 1989)"
The debate is beginning again in Auckland about the opportunities and challenges that arise with the looming possibility of Team NZ winning the America's Cup. I wrote about this three weeks ago - which was quoted in NZ Herald's City urged to get shipshape article. And Rudman wrote last week: "Minor detail of winning aside, revamped waterfront has everything needed for hosting a world-class defence..."
The America's Cup event itself may not be big enough to be classified as a Mega Event (like the Olympics or the FA Cup or - perhaps - the Rugby World Cup). 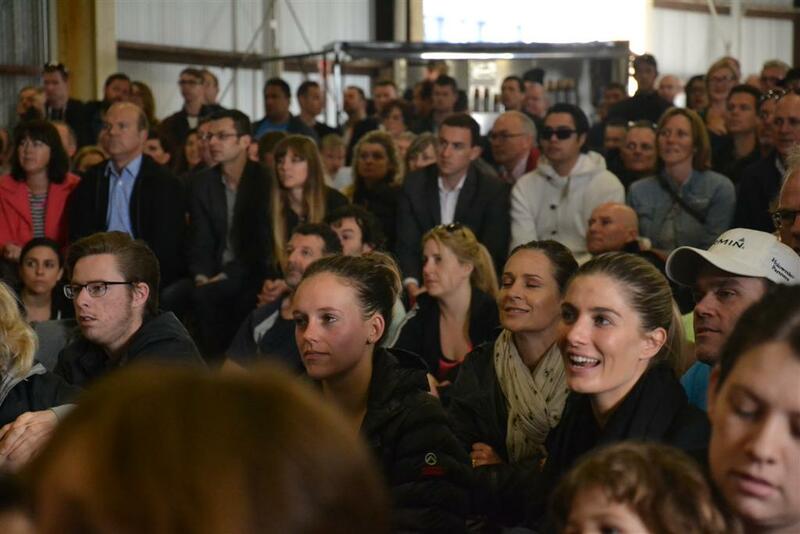 Mega-events have played a major role in the growth of tourism in Australia. The Rugby World Cup was seen as a tourism industry catalyst event in New Zealand. Internationally, Mega-events have been a major tool with which to encourage urban redevelopment and re-imaging or re-branding of cities. Maybe having the America's Cup in Auckland again would consolidate and confirm the old and slightly rusty "City of Sails" brand which needs a bit of a polish. It would also consolidate the idea that Auckland is a Harbour Edge City - a bigger and more encompassing vision than only being a Port City. So what sort of planning might be needed? Chadwick states "that planning is a process, a process of human thought and action based upon that thought - in point of fact, forethought, thought for the future - nothing more or less than this is planning, which is a very general human activity....". Which doesn't get us very far. Hall says "planning should aim to provide a resource for democratic and informed decision-making. This is all planning can legitimately do, and all it can pretend to do...." Which introduces the idea that planning decisions should be "informed" and "democratic". 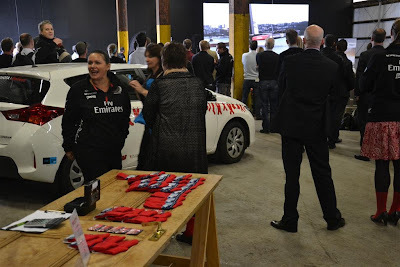 I don't share Rudman's optimism that Auckland is ready now. A lot has changed since we last hosted the event. There are only one or two syndicate bases in existence for example - and there might be ten syndicates - and these may want to locate in Auckland for up to a year before the event itself. 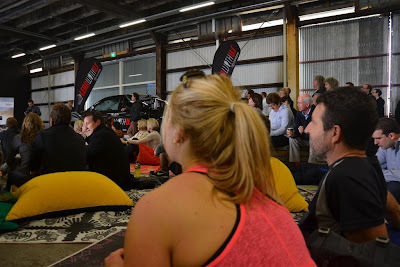 Not only would Auckland be hosting an event which lasts a few weeks - Auckland would be hosting a whole sub-culture, industry, economy and supporting population for a year. This would add to Auckland's appeal as a visitor destination - and by "visitor" I am including and emphasising visits by Aucklanders and Kiwis. I say this because there is a tendency to talk up the benefits of overseas tourism, or cruise ship tourism - which I support - but not to the exclusion of local tourism. Local community development. When Auckland had the big Rugby World Cup days, those numbers, the hundred thousand plus who turned up on the waterfront, were mainly Aucklanders. That is the kind of interest and energy that needs to be tapped into, and attracted to the waterfront, through the planning for this next America's Cup event. I agree there is some useful waterfront infrastructure now that we didn't have last time. We have Queens Wharf and Shed 10 (and the Cloud I know). And we have Wynyard Quarter - especially North Wharf - and we have Viaduct Events Centre. And we have the immense potential of Wynyard Point (where the tanks are), and the long stretch of Wynyard Wharf. These places are full of potential. 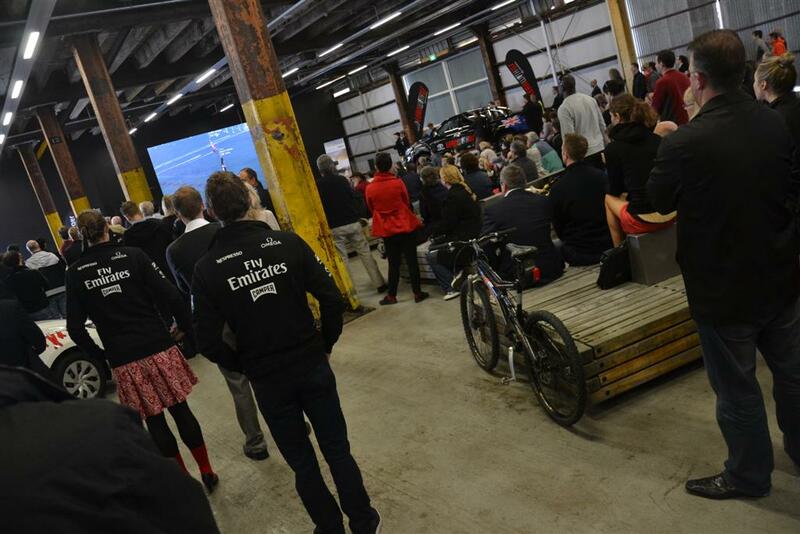 And the America's Cup presents an opportunity to tap into these assets and develop them - perhaps temporarily, perhaps for the long term. But if Auckland is to become a Harbour Edge City - and this can be an event to build on that idea - then a planning decision might be to "share the love". A syndicate might choose to locate in Devonport Navy Base. I'm sure the Navy'd love to be asked. Open for tourism. A syndicate could choose to locate on Marsden Wharf or Captain Cook Wharf or both. After discussion with Ports of Auckland. Hobsonville Point is screaming out for something like this. Room for a couple of syndicates there. The more secretive ones perhaps. Close to the struggling marine industry cluster there. And how about Mechanics Bay. Could we fit one in there? 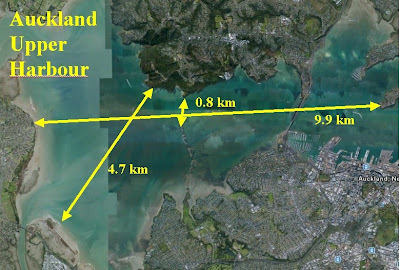 I've mentioned in another posting the possibility of having some/all races within the Waitemata Harbour. I know - it's only an idea. This sort of location for this event can become the trigger or catalyst for Harbour Edge infrastructure initiatives that tie in with the actual event (rather than hosting), and improve Harbour Edge parks and public viewing points, and add to existing Harbour Edge cycle infrastructure (for example there is a developed cyclepath now through Westhaven - along that section of the Harbour Edge. This screams out to be connected along Tamaki Drive, and onto Skypath and across the Harbour Bridge which might be a viewing platform - part of the Arena that Waitemata could become for the event, and then become part of Auckland's public waterfront furniture. 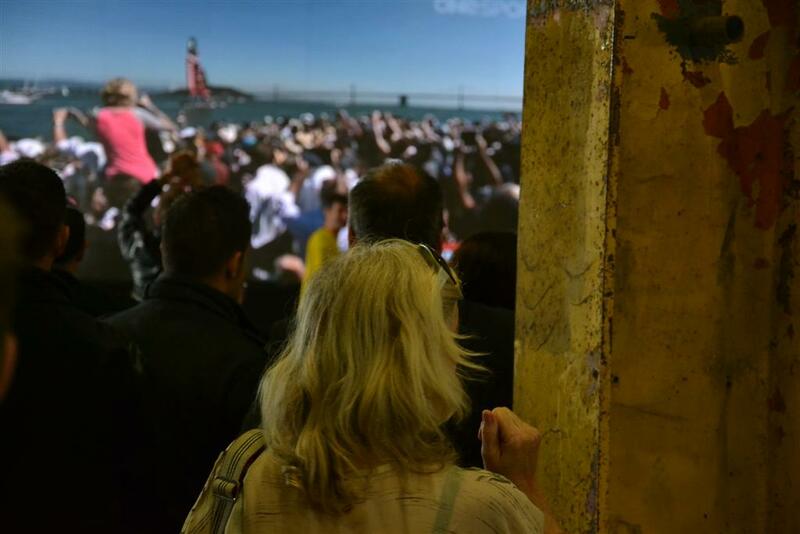 But something has been lost since the grand planning that went with the previous America's Cup. Then Auckland had the robust and well organised Auckland Regional Services Trust which owned the Port and various other waterfront assets and was able to plan and coordinate projects in an integrated way. 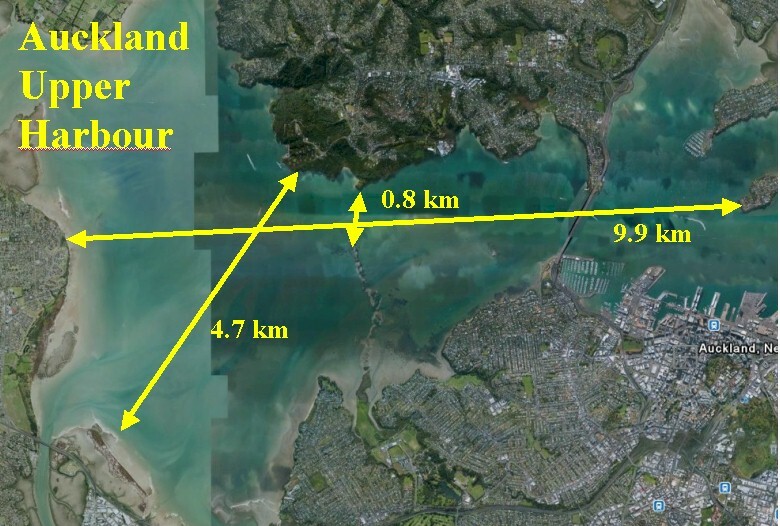 It could also rely on a focussed Auckland City Council and an Auckland Regional Council employing the Harbour Master and focussed on the Harbour Edge and regulation of marine water spaces. Institutions and responsibilities have become fragmented since the supercity organisation. For example the Waterfront Development Agency is expected to focus on Westhaven to Queens Wharf - skip the Port - and then a little bit of Mechanics Bay. The Port, while sometimes behaving as a law unto itself, is owned and presumably managed by the Council CCO Auckland Council Investments Limited (ACIL). And the Harbour Edge itself is governed by Auckland Council - which is totally distracted with Unitary Planning, Spatial Planning, Annual Planning and managing debt. If Auckland genuinely wants to move toward being a Harbour Edge City then it needs to develop the institution that can plan and manage that transition. In the past Auckland has had the Auckland Harbour Board (AHB) which had a range of objectives. But in the 1980's this was converted into the Ports of Auckland Ltd whose main objective was "to be a successful business". AHB's other objectives were either set aside or relegated to the Auckland Regional Council which has now been abolished. Consideration needs to be given to expanding the powers and jurisdiction of the Waterfront Development Agency (WDA). 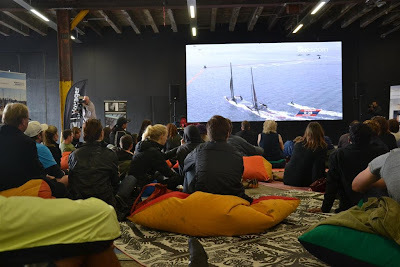 It has shown it is capable of planning events and development and infrastructure in its part of Auckland's waterfront. In that regard I'd agree with Rudman, and that we can build on what we have already. How about WDA becoming the Waitemata Planning and Development Authority? 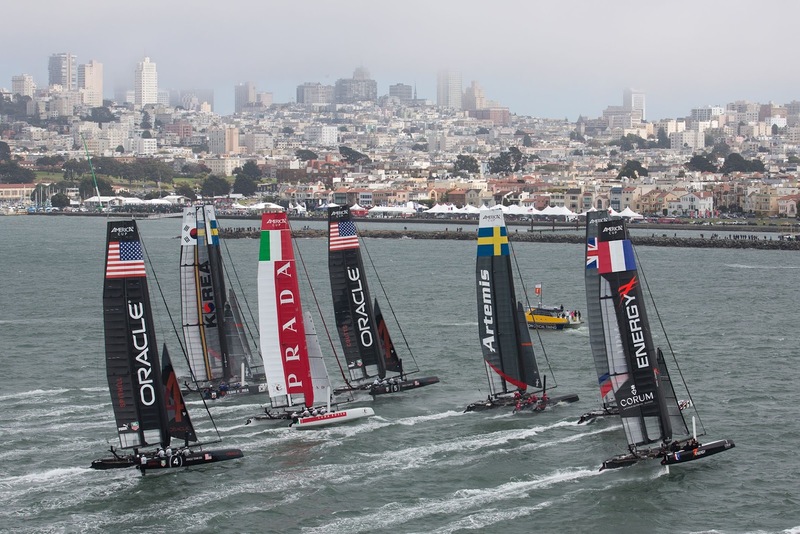 I read in the media that McCully and Key are turning their minds to what Government might do with the America's Cup. That's good. But it has often been the case that the attention of government to the potential economic benefits of tourism can itself become the major driving force for planning. The result has often been 'top-down planning and promotion that leaves destination communities with little input or control over their own destinies' (Murphy 1985 153). Attention is gradually becoming focused within academic discussion of tourism planning on the need to integrate social and environmental concerns into the economic thrust of much tourism and event planning development. What Auckland needs is waterfront planning that is an integrated process, based on careful research and evaluation, which seeks to optimize the potential contribution of the America's Cup opportunity to citizen welfare and environmental quality - not only GDP. Chadwick, G. (1971) A Systems View of Planning. Oxford: Pergamon Press. Getz, D. (1987) Tourism Planning and Research: Traditions, Models andFutures. Paper presented at The Australian Travel Research Workshop,Bunbury, Western Australia, November 5-6. Hall, C.M. (1994) Tourism and Politics: Policy, Power and Place. London JohnWiley. Murphy, P. (1985) Tourism: a Community Approach. New York and LondonMethuen. Murphy, P. (1994) Tourism and sustainable development, in W. Theobald, (ed) Global Tourism: The Next Decade. Oxford Butterworth Heinemann 274-290. This is the America's Cup race course in San Francisco Harbour. The Louis Vuitton Regatta and the America's Cup Match racing happened here. 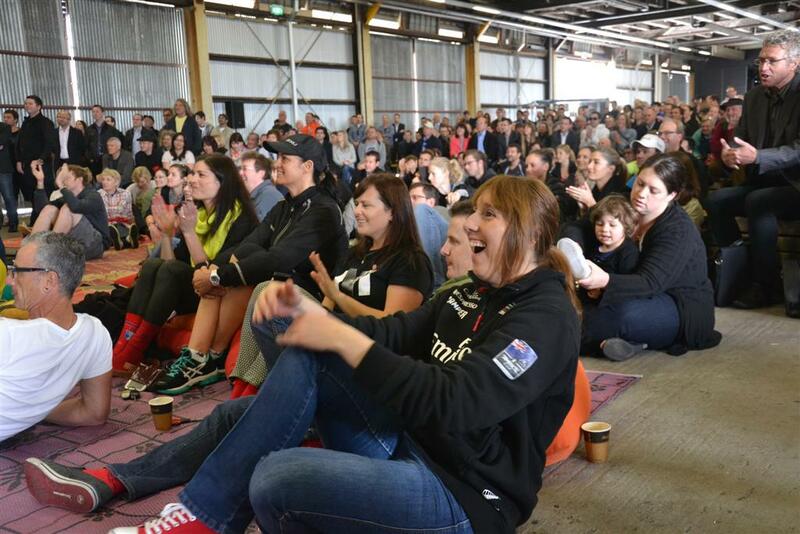 Last time Auckland hosted these races for the America's Cup event they were largely held in the Hauraki Gulf. If we did that again - and maybe we have to for reasons I am not aware of - then the City of Sails might miss out on the kinds of opportunities that San Francisco's race course location offered. 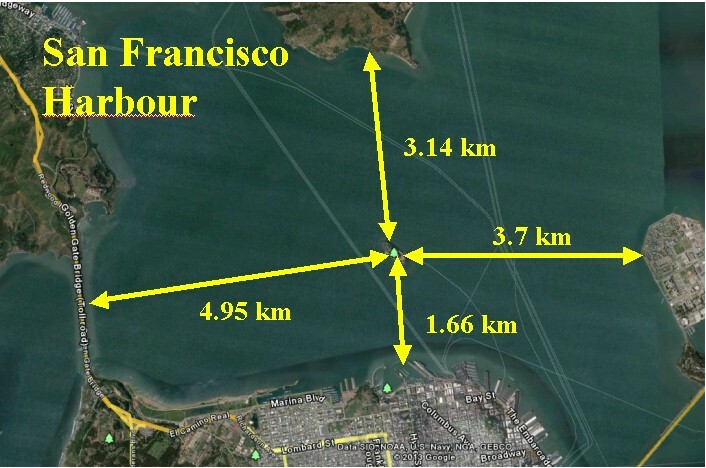 Here are some dimensions of the San Francisco Harbour area where the racing is being held. The green dot in the middle is Alcatraz. 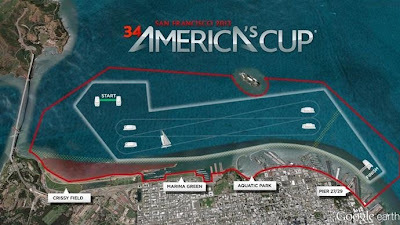 You can see that the red lined America's Cup zone (in the course map above) is about 8kms long and narrows to about 1.5kms (on sea) in width. 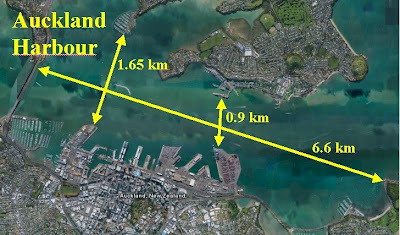 This shows some dimensions of Auckland's waterfront. It would be tight to fit the same sort of America's Cup course zone into this water space. (NB: another good reason not to reclaim more of the harbour). But it is probably do-able for AC72 racing. This shows dimensions of Auckland's Upper Harbour. Many of you will have sailed in this piece of water. Sheltered from chop, but a great sail because of good steady winds. Probably not at the same strength regularly as we have seen in San Francisco - but often very frisky - as I have experienced. There is a narrow point between Meola Reef and Birkenhead. These are the main dimensions of the AC72 flyers we have seen in action in San Francisco - by the way - in terms of economic development I understand we made one or to of these at Hobsonville - and we could make more if required. While some commentators hark back to the more traditional form of America's Cup boat racing - these high tech flyers do bring huge excitement and interest. Formula One on water. 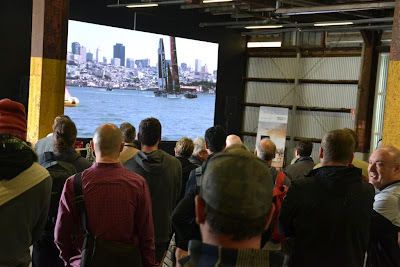 You can see here that the maximum draft of an AC72 is 4.4 metres. That's the maximum depth it needs to sail. Of course when they are flying they need much less water than that. But the big thing is the wing sail. The mast height is 40 metres. This makes for a very interesting race option for Auckland. 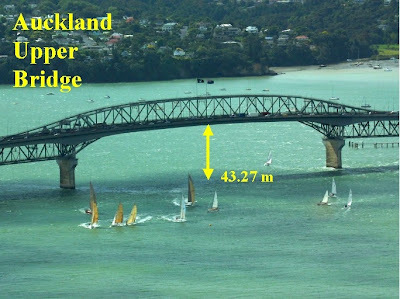 We could put the course under the Harbour Bridge. Or perhaps the starting box, or the finish. 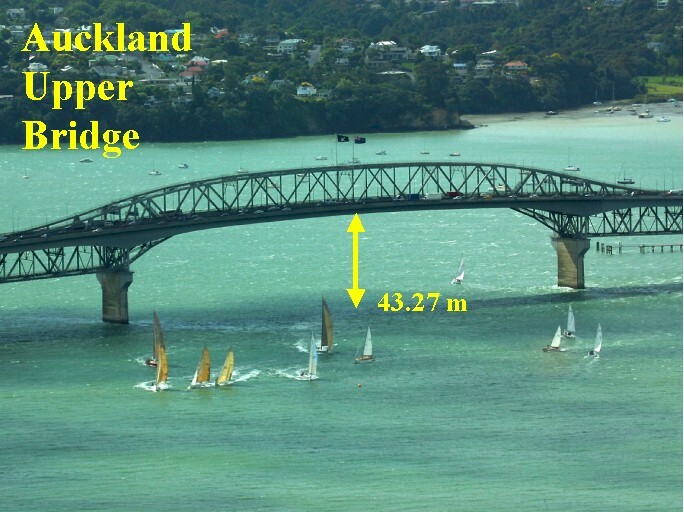 But given the races last a little over half an hour, for some races NZTA could close one of the clip-ons on the bridge to traffic and open it up to pedestrians. We are the City of Sails. So let's bring it right close to home so everybody can enjoy it up close. The photo opportunities would be fantastic. Maybe the finish line could be off the end of Wynyard Point, or Queens Wharf. The prestart and starting line could be positioned so the best view is from the bridge. Can't wait. Friday morning, 8:15 am. Apparently the roads were deserted. 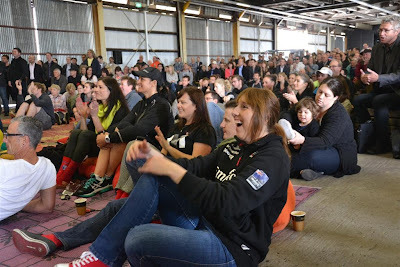 The kiwi crowd on TV merge with the kiwi crowd in Shed 10. Today Auckland Council, Auckland Transport and the Waterfront Development Agency are working together on an integrated approach to delivering the Mayor's vision - part of the Auckland CBD Waterfront Plan - for Quay Street. Part of that idea is the partial - if not complete - pedestrianisation of Quay Street between Britomart and Princes Wharf. When the Auckland Harbour Board (which basically was transformed by legislation into Ports of Auckland Ltd in the late 1980's) developed its Quayside plan, it owned much of the relevant land which had been reclaimed. 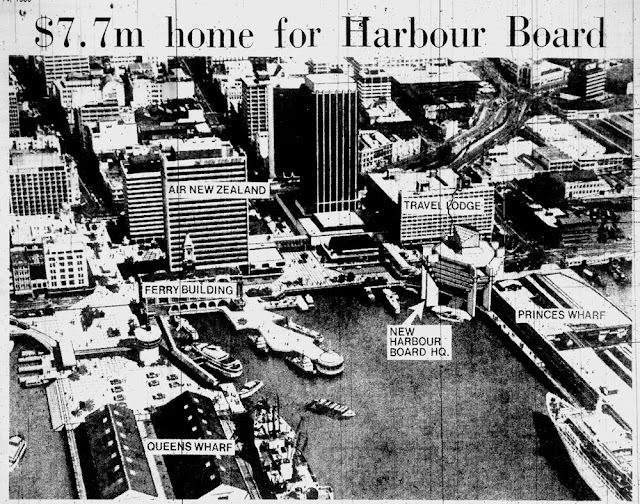 The Auckland Harbour Board idea for Auckland's downtown waterfront was a very positive one. And it is a great pity that it did not act on its plan and actually implement it. The image above is not especially clear and detailed, but you can make out the paved spaces joining Queen Elizabeth Square across Quay Street with the base of Queens Wharf. You can see that Albert Street was a pedestrian precinct across Quay Street to the waterfront. 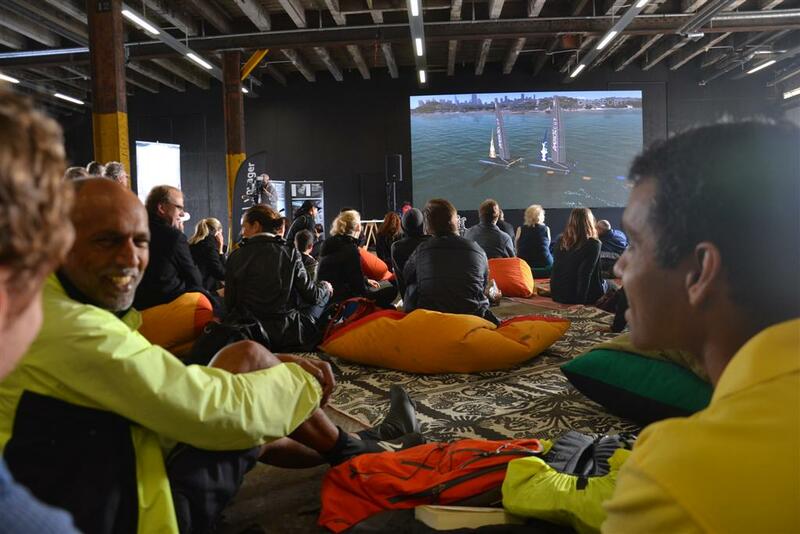 And you can read in the caption that Auckland Harbour Board's Chairman that the idea was to "bring the port to the people", and that "Princes Wharf would be more open to the public". You can see the intended design of the AHB Headquarter building in the picture too. It was designed so that there was open access from Quay Street onto Princes Wharf underneath the new HQ. That's not how it is today - as you can see in this posting. AHB got its new HQ, but Auckland didn't get the Quayside waterfront that appeared to go with it. Hopefully, 33 years later, a third of a century later, the powers that be can join up the dots and deliver on that unmet promise. Time for action. I listened to some of the debate that occurred at the Auckland Council three plus day marathon meeting about the Unitary Plan. It was an unusual meeting in that the Chairs of all of the Local Boards had their own table (closest), next to the ring of tables with Councillors, Mayor and senior officials. This posting contains a few snippets of what happened, and some thoughts after the event. 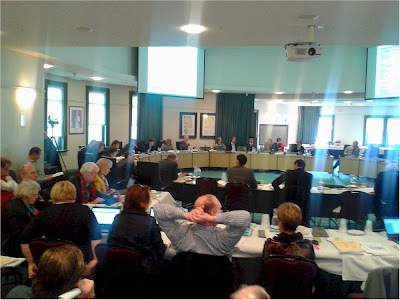 The meeting to deal with the Unitary Plan proper began on the 28th of August. Penny Pirrit kicked off the meeting with a presentation about the process that had been followed, summary of key debates, issues to resolve, and her introduction to officer recommendations. She was at pains to point out that normally the kinds of debates that would occur prior to District Plan notification would be held in confidential. That has certainly been my experience. The main reason for this is that the value of land can change markedly when land use zonings change. In other words that private property rights are changed and influenced by District Plan changes, and that it is appropriate for such considerations to be conducted without undue influence of those seeking to maximise personal gain - in some cases at the expense of others. One of the items she brought to Council's attention was a review conducted by Dr Ann McAfee, who is apparently the retired co-director of planning for Vancouver, Canada. She was asked to independently review the "enhanced engagement" process used to "support the draft Auckland Unitary Plan". 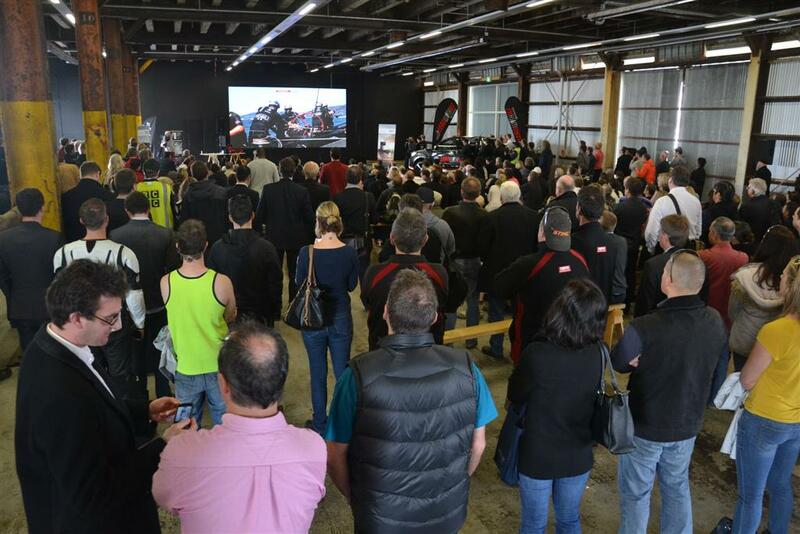 This is a reference to the process the council has undertaken whereby submissions and engagement have been sought from Auckland public, prior to the formal notification process which the RMA requires. Dr McAfee does state: "within a short time frame Auckland has done an exceptional job reaching out to a broad range of stakeholders..." and: "the conclusion of this review is that the Auckland process represents an example of best international practice".... These are the quotes which receive most attention from Auckland Council. 1... An Enhanced Engagement Process will only work if elected and appointed officials embrace the process with a genuine conviction that public engagement improves plans and plan implementation. Ms Pirrit's introduction also provided information about the process that will unfold, once Council decides to notify the draft unitary plan. This is a process that comes with considerable risk for Auckland. Normally the Council that will be implementing a District Plan (Unitary Plan) would appoint commissioners - in the recent past these would have included elected councillors. But for Auckland's Unitary Plan it will be Central Government that appoints the commissioners to hear submissions and to make recommendations on how the draft plan should be changed. These are recommendations. It will be up to Auckland Council to accept or reject those recommendations. But the pattern has been set that - generally - a Council will feel compelled to accept commissioner recommendations "because they heard all the submissions and they considered them all when making their integrated recommendations...". But it's more challenging even than that because Central Government is in the midst of making major changes to the Resource Management Act itself which are criticised by many because they threaten to turn the RMA into a National Development Act, a key tool in what is perceived as Central Government's focus on growth at all costs. So the prospect for Auckland is that no matter what is in the draft Unitary Plan that Auckland Council decides to notify, its final fates rests in the hands of Government appointed commissioners, who will be measuring it against legislation that is only now being finalised, and whose purpose will be very different from the sustainable management of resources that has underpinned environmental law for the past 20 years. 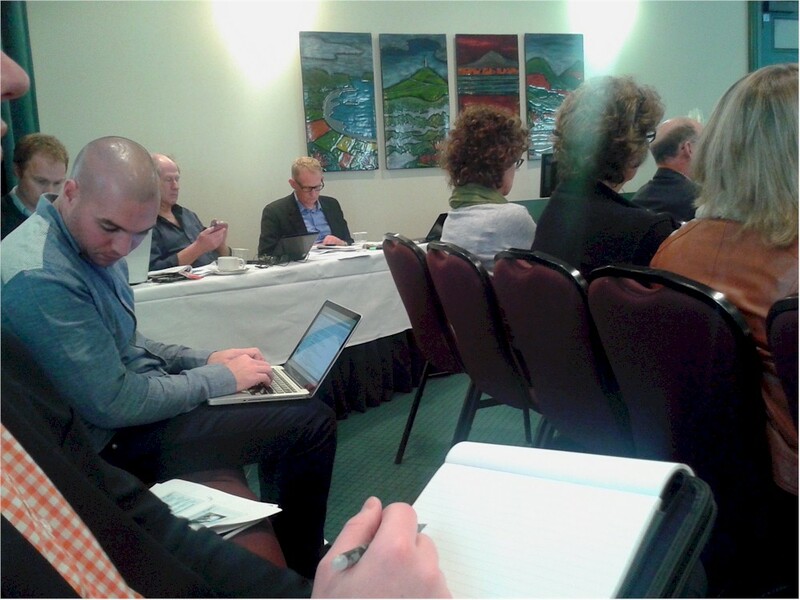 Cllr Coney got the ball rolling by criticising the Unitary Plan Regional Policy sections as "thin". She was backed noisily by Cllr Lee on this. Cllr Fletcher as concerned that the workshop meetings that had been held were being interpreted as "decisions" by officers. She was worried that the whole thing was being "officer led" rather than "politically led". Cllr Brewer then moved an unusual amendment to the main motion whose effect was to shift the date for notification out to November - to give the incoming council opportunity to consider the draft. This move got little support and was lost 15 votes to 6. This has always been the most controversial zone. How wide-spread would intensification be. How high would it be. What sort of controls would be in place. And so on. I cannot possibly do justice to all of what was going on in the room for this discussion. In the background is the Press table. Bob Dey and Bernard Orsman making sense of it all. Reporters there from Metro and Radio New Zealand. The guts of this part of the meeting was kicked off by John Duiguid - a highly competent senior planner who I remember worked at North Shore City Council when I was there. We heard from Deputy Mayor Hulse that he had been chosen to front the officer side of this part of the meeting because of his style and clarity. It was all familiar stuff to me. Reminiscent of the kinds of matters you are expected to deal with as a commissioner when considering a development application in a typical - say - Takapuna or East Coast Bays residential neighbourhood. I make this comment because I want to say that there was a level of technical detail in John Duiguid's presentation that takes someone who is to act as a commissioner some time and practical experience to fully appreciate. I recall when I worked as a commissioner, the first few months you were led by an commissioner who knew the plan well, and could explain the implications of the various rules, what they were there for, what they were designed to protect, and so on. These are not simple and straightforward. I also recall when North Shore City Council (NSCC) developed the District Scheme (Structure Plan) for Long Bay. This was - in effect - the Unitary Plan for Long Bay. It was developed from scratch - a bit like Auckland's Unitary Plan - and it took NSCC several years of detailed work to finalise. And I have to say that I don't think that process could have been cut much shorter. Councillors involved in the decision-making, alongside skilled planners, made the decisions. All of the councillors had performed as resource consent commissioners and understood the whys and wherefores of what they were doing. The same cannot be said for Auckland Councillors. The comments made by some councillors about "height to boundary" controls, and other detailed but important controls, made me cringe. But they pale into insignificance alongside comments made supporting an amendment to the Unitary Plan moved from the floor. Someone actually moved that every dwelling in the mixed housing zone should have 80 square metres of outdoor open space. No-one is arguing that kiwi families want those things, and that homes should be available with a nice big lawn. But such comments reveal poor understanding of the fact that in Auckland there are thousands of people who don't want - anymore - a lawn to mow, they don't want a garden to look after. Instead they want a safe lock up and leave, or get home late and get up early sort of apartment. A home they can wear and use - rather than one to tend and develop and worry about. As someone said to me: "housing is a verb, as well as a noun....". That is why it was completely inappropriate to force every dwelling to have an 80 square metre lawn. Thankfully that amendment was lost. I don't want to use this posting to be mean about Auckland councillors. The problem with the Unitary Plan is not the councillors. The problems Auckland is having are the direct result of the legislation setting up Auckland Council which forced it into preparing a spatial plan followed by a unitary plan in such a short time, driven by Central Government economic growth and development priorities. There is a sense of inevitability about local communities fighting back against the threat of essentially unregulated development over the fence. That is what various versions of the mixed use zone would have permitted. Under a totally free-market regime, anyone would be able to redevelop any residential property in Auckland to the maximum extent without any regard for neighbours. That would be a free market. It would also be a free for all. It would be anarchy. Government would like to unleash market forces in Auckland. Cut the red tape and all that. But there is an inbuilt contradiction. 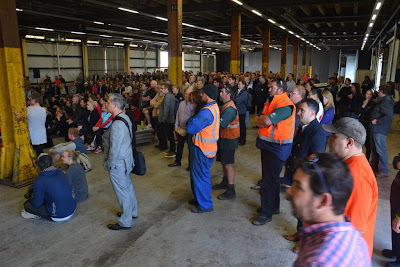 There are already people here, living happily in Auckland, with their own ideas and plans about their futures, and they are behaving entirely rationally when they defend their homelands against invasion by developers in Toyotas and bullldozers. Appropriate land use planning and regulation is an essential component of city development and city stability. Investors - be they home owners or property developers - all rely on certainty. The balance has not been struck in the draft unitary plan provisions for the mixed housing zone, and that is its fundamental flaw. The last ditch Council decisions to drop intensification provisions is the democratic expression of Council's failure to resolve the flaw. It won't be until there are effective Precinct and Area plans that will allow neighbourhood and community planning, that this conflict will be resolved in Auckland. Interesting result for Mangawhai Ratepayers Association....after their first day in the High Court. (You can read here my account of that day). 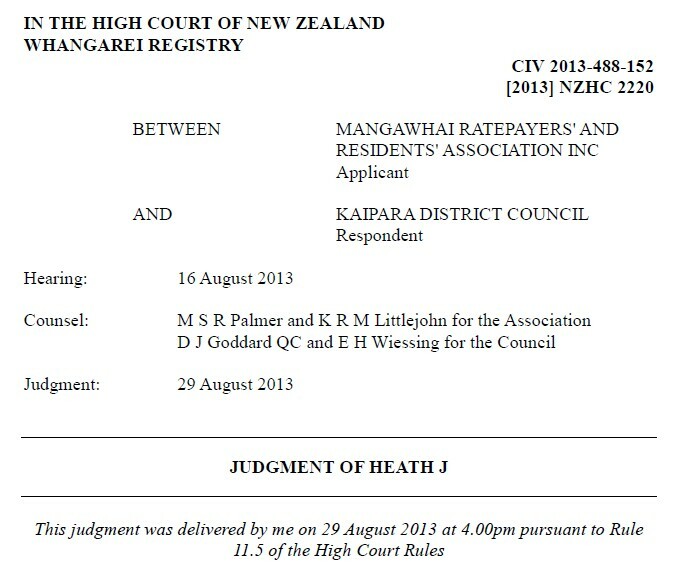 Mangawhai Ratepayers’ and Residents’ Association Inc (the Association) seeks judicial review of certain decisions made by the Kaipara District Council (the Council), all of which arise out of the Council’s resolution, in August 2005, to construct a sewage treatment plant at Mangawhai. The primary focus of the proceeding is on the question whether rates levied to meet the cost of the project were unlawfully struck, in the sense that they were assessed and levied in a manner that was beyond the powers conferred on the Council by the Local Government Act 2002 (the Act) or the Local Government (Rating) Act 2002 (the Rating Act). That challenge necessarily involves a consideration of the circumstances in which the Council resolved to build the plant and to borrow money to pay for it. It is now acknowledged that there were irregularities in the rate fixing processes; so much so that the Member of Parliament for Northland has promoted a local bill that is designed, if enacted, to validate the Council’s actions. This proceeding demonstrates how badly things can go wrong when a democratically elected Council assumes significant financial obligations to an arm’s length third party without disclosing the extent of the borrowing to its ratepayers. As the Bill is presently making its way through Parliamentary processes, it is inappropriate for the judicial branch of Government to comment on the appropriateness or otherwise of the Legislative branch taking steps to validate the rates. The corollary is that, in the absence of legislation having the effect of proscribing this Court’s ability to hear and determine an application for judicial review in respect of the relevant decisions, this Court must proceed to deal with it. While there are other grounds for advancing its application, the primary plank of the Council’s case is that, as a matter of law, there is no right to challenge decisions of that type because the financing arrangements are “protected transactions”, for the purposes of s 117 of the Act. Certificates given under s 118 of the Act are said to create an irrebuttable presumption that the Council has complied with the requirements of the Act in relation to those transactions, even though it may not (in fact) have done so. interpretation reflected a “black is deemed to be white” approach to the application of s 117. Mr Palmer advanced a more nuanced interpretation. While accepting the need to protect the validity and enforceability of the loan agreement between the Council and ABN Amro, Mr Palmer submitted that the section did no more than that. It did not, he contended, authorise the Council to levy rates or to borrow other money to repay a loan into which it had entered unlawfully or (in an administrative law sense) unreasonably. That approach contrasts with Mr Goddard’s submission that protection of the transaction necessarily carries with it an implicit power to levy rates to meet financial commitments made pursuant to it. Mr Palmer submitted that the creditor’s rights to enforce payment of its loan were unaffected. It retained the ability to obtain a charging order over moneys coming into the Council’s accounts, to seek the appointment of a receiver,24 or to take any other available debt collection step. Mr Palmer submitted that was the consequence of the validity and enforceability of the transaction being “protected” by ss 117 and 118. ...... I accept Mr Palmer’s submission that declaratory relief could vindicate the ratepayers in a manner that might not otherwise be possible. There is, I perceive, a real difference between a solemn declaration made by the High Court, exercising its supervisory jurisdiction over statutory powers of decision made by public officials, confirming a particular state of affairs and (for example) a report issued through the Office of the Auditor-General. Without wishing to understate the value of a report from the Auditor-General, it does not carry the same authority as a decision of this Court. Any judgment of this Court will be given after full argument from both sides, contain transparent (and publicly available) reasons and be subject to rights of appeal. What the judge is talking about here when he mentions: "declaratory relief", is what MRRA is asking for in the judicial review. MRRA is asking for the judge to declare whether certain of KDC's decisions were unlawful. The judge is stating here that a report from the Office of the Auditor General (even though we are all very keen to see it!) does not have the same weight. For those reasons, I dismiss the application to strike-out the first cause of action. Counsel were agreed that costs should follow the event. Costs are awarded in favour of the Association, on a 3B basis, together with reasonable disbursements. Each shall be fixed by the Registrar. I certify for second counsel and direct that their reasonable travel and accommodation expenses should be included within the disbursements to be fixed. I direct the Registrar to set this proceeding down for a case management conference before me at 9am on the first available date after 12 September 2013. I invite counsel to confer about directions that may be required and to confirm the length of time estimated for the substantive hearing. From discussions at the conclusion of the hearing of the present application, I understand that five days will be required, based on my decision to permit all causes of action to go to trial. The joint memorandum shall be filed no later than midday on 12 September 2013. Although I have received indications from counsel as to their availability in November and December, I have not yet been able to secure a hearing date. I will endeavour to do so before the next conference date and advise counsel. So this means that MRRA has won the right to a full judicial review of the most problematic decisions of KDC. But not without enormous cost to individuals, hours of voluntary work put in, stress-filled hours, and the feeling that New Zealand institutions are doing their best to thwart, delay, procrastinate, and otherwise frustrate resolution of an immense and apparently obvious injustice.